Help the Little School while doing your regular shopping! As we kick off a new school year, we'd like to remind everyone that the PTO has several easy ways for you to help us raise funds for our school! The money we raise through the initiatives below go directly to the Little School and assist the PTO in paying for enrichment programs, field trips, teacher stipends and much, much more. Shutterfly and TinyPrints: Start your order through the Little School storefront, and 13% of your purchase will be donated back to the Little School! Amazon Smile: Set up the Little School PTO as your your favorite charitable organization just one time, and 0.5% of all eligible AmazonSmile purchases will be donated to the PTO, at no cost to you. Stop & Shop Rewards: Register your Stop & Shop card at www.stopandshop.com/aplus or call 1-877-275-2758 with your 13 digit card number. 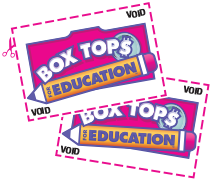 Box Tops: Simply clip Box Top coupons and send them into school! Each Box Top is worth $0.10. We collected more than 20,000 box tops last year which translated to over $2,000 for our school! Every box top makes a difference! Newer PostSecond Annual Halloween Bash: A haunting good time!